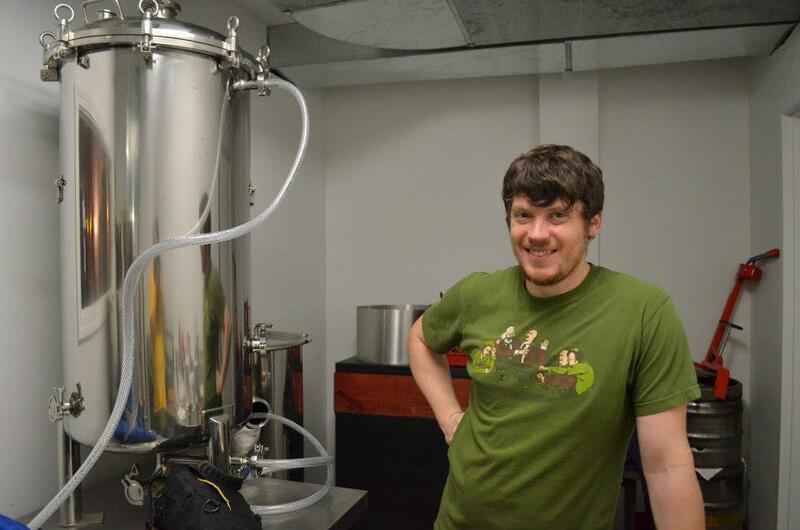 I am currently brewing a few test batches to calibrate our brewing equipment and our brewing acumen. At this stage, I will have ulterior motives with my batch selection to play with various ingredients and have some fun. In the long run, I hope to be brewing one style of beer at a time, even though this recipe may be adjusted for the seasons. Papa Louie’s is a recipe that I have honed in on over the last few years of home-brewing. Named after my Czech grandfather, this recipe infuses Czech ingredients into a Scottish 60 Schilling. It is a light, mild beer that should have subtle flavors. Much like beautiful music can be actively listened to, looking for dynamics, tones, and harmonies, or passively enjoyed by letting it wash over you, I am striving for a beer that can dance upon the equilibrium of bold flavors and nuanced hop profiles. This is a picture of my bright beer tank. It is being re-purposed as a tax determination vessel for the TTB for the time being. My friend Jay was helping me here with the set-up of the tanks, calibrating the equipment, and a million other tasks. Thanks for your help, Jay! He is now in Colorado with his amazing wife, living in a beautiful cabin in the mountains. I should also mention that he is a first-rate brewer, with several gold medals at local homebrew competitions, as well as a certified BJCP judge. So for now, we brewed Test Batch #1, a very mild beer that will help us identify any potential flavors we want/don’t want. Oh my goodness! Amazing article dude! Thanks, However I am encountering troubles with your RSS. I don’t know why I cannot subscribe to it. Is there anyone else getting the same RSS problems? Anyone who knows the solution will you kindly respond? Thanks! !